The purpose of St. Mary's Alumni Association is to promote alumni involvement with the school, increase alumni awareness of current happenings at St. Mary's, and to strengthen friendships among former students. Alumni events include a high school alumni volleyball game and a high school seniors' reunion picnic. Adult events bring together St. Mary's graduates from many decades. Our alumni lead interesting lives and we love to hear from you. Our former students have become: Valedictorian… Rhodes Scholar… Engineer… Head Chef… Doctor… Google Software Engineer… Teacher… Information Technology Specialist… Ph.D. in Immunology and Molecular Pathogenesis… International Performer… Seibel Scholar… Attorney… Dancer… Gymnast… Coach… Jazz Musician… Phi Beta Kappa… Opera Singer… Lobbyist… Appraiser… Wall Street Stock Broker… Press Secretary for Mayor of Chicago... NCAA National Champion... the list goes on! Please keep the St. Mary's family updated on all your latest news. Email alumni@smeds.org with graduations, honors, marriages, births, new jobs, and anything else of interest. Thank you for your time and support. The 8th grade class of 2009 and their families gathered again on Sunday April 21st. 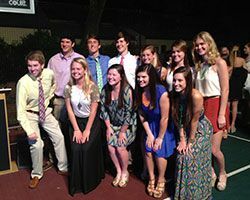 At the annual "Senior Send Off", St. Mary's alums have a chance to say goodbye as they graduate from high school and head off to college. News was exchanged and stories were shared over a buffet supper in St. Mary's Hall. There were more than a few laughs as Headmaster Laird reminisced with each student. 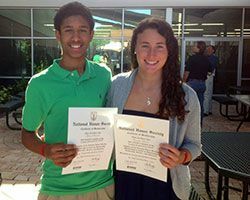 Our 2009 alums were accepted at Auburn, Clemson, Columbia, Emory, Florida Gulf Coast, Florida State, Harvard, MIT, Middle Tennessee State, Oklahoma State, The U.S. Air Force Academy, University of Alabama, UCF, UF, University of Georgia, University of Mississippi, UNC Chapel Hill, University of Richmond, USF, UT, Vanderbilt, Wake Forest, Northwestern, and Washington and Lee. Congratulations!